My wife and I make extra money by trading stocks online. We started trading stocks as a side hustle when we needed to make extra money a few years ago. We had some luck early on while the market was making new highs every few months. I think everyone was making money trading at that time. We used our initial trading profits to pay off our student loan debt. Unfortunately our luck did not last, and we lost $15,000 trying to trade stocks over the next 6 months. It took three years of trial and error to finally settle on a trading strategy that worked consistently for us. Stock trading is an exciting and potentially profitable way to work at home and escape your conventional job. We discovered many helpful training resources as we learned how to trade. We joined stock trading alerts services, chatrooms and purchased training DVDs to learn how to trade successfully. You can read reviews of these training resources on our stock trading review site, Stockmillionaires.com. Short-term stock trading can be extremely profitable. We regularly make 10% – 25% gains on our short- term trades. Last month we made thousands of dollars stock trading. We spent a total of an hour or two earning that money. You can start learning to trade with $100. Sure, your profits will only be a few dollars per trade, but it is best to start slowly while you learn. Stock trading as unlimited earning potential. Some short-term traders are making millions of dollars per year trading from their couches. Trading stocks offers you flexible work hours. Trade as much or as little as you want to. Learning to trade stocks is like a rollercoaster – it is exciting, terrifying and massively fun all at the same time! I have tried many different ways to make money online. My wife and I have started many freelance businesses from blogging to freelance proofreading online. We have found that stock trading has a steep learning curve to conquer, but it offers the largest potential income with the least amount of work. In many freelance businesses you are directly exchanging your time for money – this is not the case with stock trading. Stock trading is a risky endeavor, but the risk can be managed with practice and experience. Stock trading is not gambling – success is not based on luck. There are multiple ways to reduce the risk of losing money trading stocks. Learning to control your emotions during a trade is the first line of defense against losses. Fear and greed are not your friends! These two emotions are probably responsible for more trading losses than any other factor. Trading stocks is a mental game, and failure to control your fear and greed is the fast track to the poor house in trading. The aim of this article is to give you an overview of how we make money stock trading online and how you can learn to do the same. We rarely buy and hold a stock for more than a few weeks. Usually, we only own a stock for 1-4 days! Investors will usually buy a company’s stock when they are convinced that the value of the company will continue to grow over the next few years. Trading is very different from investing. Traders don’t care if the company has the potential to become the next Microsoft or Apple. Traders only care about making money from the price movement over a few days. Would you rather hold a stock for two years and make 20% or hold a stock for two days and make 20% profit? We do this every week, often making 20% profit on a position overnight or over the weekend. This is the different between a trader and an investor. There are pros and cons to both investing and trading stocks. Active trading can lead to a lot more profits in a much shorter time period. This is mostly due to trading more volatile stocks and compounding gains quickly. The downside to short-term trading is that the risk is much higher. Short-term trades are usually highly volatile, and this can lead to dramatic losses if you are not careful. Always have a trading plan before you purchase a stock. Stick to the plan! Have patience with winning trades. Cut losing trades quickly. You cannot allow losing trades to negate the winning ones. Never trade with money that can’t afford to lose. Never hold a trade through earnings. Even if you think that the earnings report will be good. These are the five rules that we try our best to follow. My experience has been that if I break these rules, I will lose money on a trade. Learning a stock trading strategy is not easy. There are many different approaches to trading stocks such as trading the news, betting against companies (shorting), day trading and swing trading momentum stocks. The strategies can become ridiculously technical with all kinds of crazy indicators and chart patterns. We try to keep it as simple as possible and only trade the highest probability chart setups. Simple is easy if it works – and it has for us. 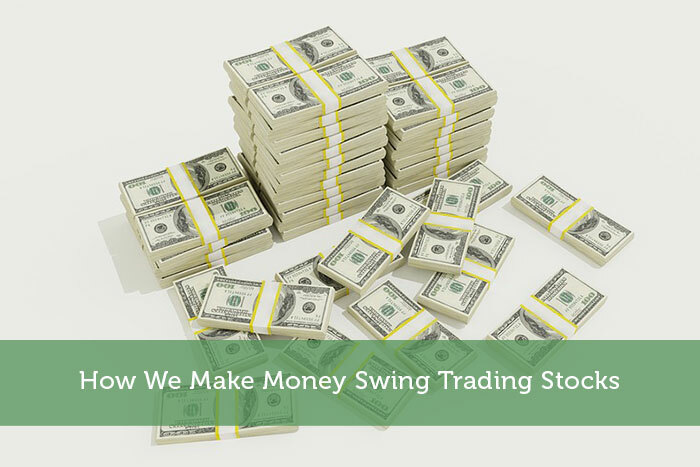 This article outlines the basics of our simple swing trading strategy. We have used this strategy to consistently make 5% – 20% profits per trade (with a 60% winning percentage). My wife and I swing trade stocks that cost less than $10 per share. Swing trades typically last between 1 and 4 days. Investors that are looking for steady, low-risk growth tend to shy away from the ‘penny stock’ markets. These lower cost stocks can provide many opportunities for quick profits though, precisely because they do not have price stability or solid business fundamentals. A ‘blue-chip’ stock is extremely unlikely to double in value overnight. In contrast, I have lost track of how many swing trades that we have made that have doubled in a day or two! Most of the companies that we trade are frankly terrible companies. They are often tiny companies with no revenue, products or cash. Often, they will be up to their eyeballs in debt. They are not companies we would ever buy and hold. The price of these stocks is often manipulated which makes the price action relatively predictable. This predictability allows us to make money by rapidly trading the short-term price action of the stock. The majority of the general public think that the way a stock price moves is random. Stock prices are not unpredictable because the price depends on people buying and selling. People tend to be quite consistent in their actions. This translates to certain patterns being generated in the stock price charts that occur over and over again. Using price charts to predict where a stock price is heading is part of a system called technical analysis. Technical analysis is used by millions of traders to make money in the stock market. It is not an exact science and of course the stock price is not guaranteed to actually go up when you think it is! The trick is in the risk management and how you manage your trading. A full description of technical analysis is outside the scope of this article, but you can read more about it here if you are interested. Trend trading is one of the main ways that we make money stock trading. Basically, we look for a price chart that shows that a stock is consistently making higher prices – in other words the stock is in an uptrend. We look for strong uptrends in a stock and wait for the perfect purchase price. The idea is simple – we buy the stock with the anticipation that it will continue the trend (at least in the short-term). If it does what we expect then we ride it for a few days and sell it for a profit. If it doesn’t then we sell it quickly and move on to the next stock. Let me show you an example of how this works and explain how you can do this as well. I want to illustrate the simplicity of trend trading by showing you once of the simplest chart patterns – the ascending channel pattern. The channel pattern can be easily explained by plotting a chart and just drawing two straight lines to show what the price direction of the stock is. Check out the nice uptrend in the price of Amazon stock over the last 9 months (below). You can plot charts of any stocks like this for free at stockcharts.com. You will have to draw in your own trend lines though unless you purchase a premium version of the software. The Amazon chart shows a nice uptrend where the price of the stock bounces between the two blue lines that I have added in. The top and bottom blue lines show what is known as resistance and support respectively. Active traders are monitoring these levels, anticipating when to buy and sell the stock and you can do the same! There is a high probability that when the price of the stock falls to the blue support line, that other traders will buy at these price levels, causing the price of the stock to go back up. When you understand this simple concept, making money trading becomes a lot easier. The opposite is true when the price of the stock increases to levels around the top blue line (resistance). Other traders will sell the stock at this point and the pattern repeats. Do you see how there is a degree of predictability in stock prices? These uptrending channel patterns also happen intra-day as well which allows for trades that only take a few hours to work. When you have identified an uptrending channel pattern, you can buy in at the support lines and sell at the resistance levels. You can sell part of your position and let the rest ride the uptrend until the trend breaks down. These types of price patterns are not guaranteed to actually continue when you buy in. Sometimes they just break down. A good example of what can happen is shown in the Amazon chart above. In September the trend failed, and the price dropped dramatically. This is where money management and discipline can make the difference – if you cut the loss quickly then you will probably be successful. If you hope that the price will come back up, then you will likely just lose money trading. It is better to sell for a small loss than risk a much bigger one – remember you can always buy back in if the trend is re-established. Always remember that these trends and patterns are just high probability trade setups – they don’t work all the time. Sure, they are likely to work but the real secret to making consistent profits is to hope for the best but plan for the worst. If you had bought into Amazon in September and stubbornly held your position you would have lost 30% in 4 weeks. We trade stocks using the simple trend pattern described above. We also use three simple chart patterns that are slightly more complex but still quite straight forward. Check them out if you want to learn more about how we make money consistently. Stock trading has changed our lives for the better and it is a fantastic way to make some extra money from home. It can be quite a passive income source, but the learning curve does take time and it can be extremely hard work initially. You can get started with a tiny amount of money (e.g. $100) while you practice and learn a good strategy.